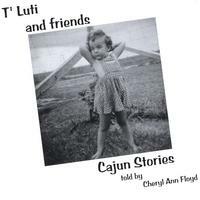 Storyteller Cheryl Floyd shares Cajun tales from her southern Louisiana roots in this sampling of humor, song and family fun for listeners of all ages. Enjoy the cadence of story with Cajun musical intermissions. I hope you enjoy these stories told with the flavor of my heritage. I was born in southwest Louisiana and grew up listening to the beautiful sounds of the Cajun language and music. Cajun is the language spoken by the descendants of the French Canadians who settled the southern part of Louisiana in the late 1700's. The stories on this recording are told in English with Cajun expressions and accent, these are an example of the way we shared tales in my home when I was a child. You will meet T'Luti whose name came from my nickname. This was the name my daddy called me when I was a little girl. Just like the little girl in the story I grew up with five brothers and thought they had all the adventures, like the one with Billy the Bull. The story of the little frog, Petite Green, is my version of Little Red Riding Hood. Her home is in Lacassine, the name of the little town where I went to school for 12 years. The last story, Charm Frog, is about a frog who loves to "play like" characters from stories, just like I did when I was a child. While you are listening to these stories, perhaps you too will see yourself in the tales. I know you will enjoy many adventures while listening, reading and telling stories. My wish for you is that after hearing these tales you and your family will tell stories from your own adventures and family times together. Laissez les bon temps rouler, Let the good times roll and let the gift of story fill your soul. You won't regret listening to this one!! The BEST Story time CD ever!! These five stories are the best short stories I have ever herd. My children just loved them! Mrs. Cheryl Ann Floyd has one of the BEST story telling voices that I have ever heard on a children's CD. This will be a family favorite for many young generations. Embodies the flavor of growing up Cajun in Louisiana. Warm and spicy, just like a good gumbo, these stories gave me the flavor of growing up in Louisiana. I am looking forward to sharing them with my whole family this Christmas. I know young and old alike will enjoy listening to these delightful stories told with that melodic Cajun accent and great foot-tapping music. Cheryl Floyd's love for her culture overflows in this CD. Her storytelling captures your heart and fills you with pride for your culture whether it's Cajun or not. The songs weaved into the stories keep you humming long after the story is over. What a great way to share a culture!